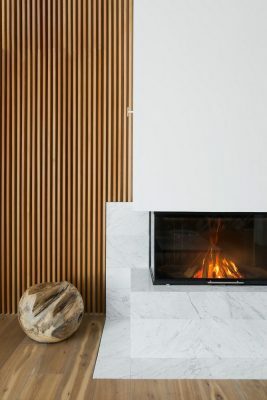 A country house featuring precise geometry and natural materials, the architecture of this private house is a synthesis of natural materials, such as stone and wood, and simple geometric shapes. The façade’s modern design combines stone and wood: the exterior finish, featuring warm shades of travertine and larch, completes the image of an inviting, cozy and modern country home. 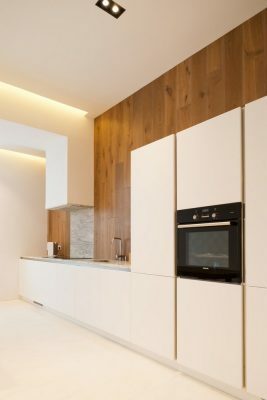 The primary concept combines minimalistic geometry, light-coloured natural finishes and wood planks inside and out. At the outset, the client expressed a desire for an architecturally interesting house that would accommodate two generations comfortably. 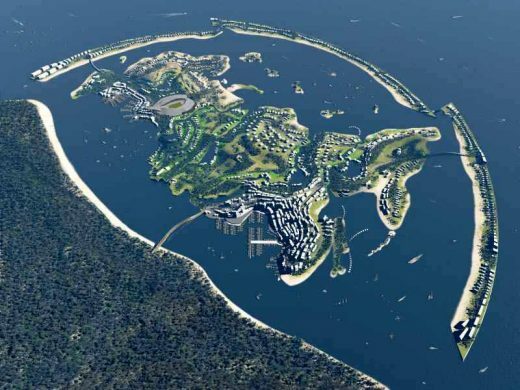 There were no particular style requirements, giving the architect free rein to propose a wide range of solutions. The final design meets the primary goal: that each family member should have their own private space, along with spacious common areas for socializing. 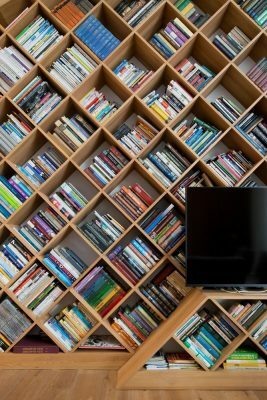 The project’s overall form is based on the integration of three functional units into a single volume. As a result, the house plan is a rectangle consisting of three square blocks arrayed in a line. Each block has a specific function. 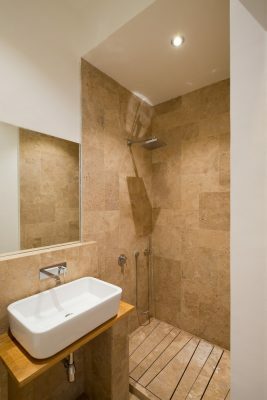 The first contains the kitchen and foyer on the ground floor, as well as a bedroom and bathroom upstairs. 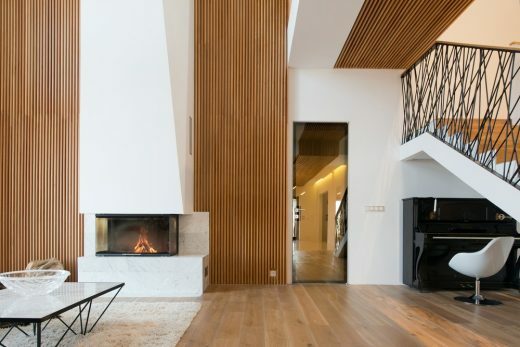 The next block is a double-height space with a living room with fireplace; a stairway leads to a pair of bedrooms on the top floor. The third block, adjoining the second, contains two bedrooms. The master bedroom, including a study and en-suite bathroom, is on the ground floor. Upstairs is another large bedroom, including an open balcony and a guest bathroom. 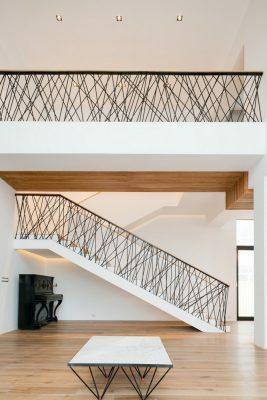 To make every room in the house more accessible, and to increase the number of private entrances on the second floor, there is another staircase leading directly to the bedrooms. The same stairs also lead to a rooftop patio on the second block, adjacent to a leisure zone including a bedroom and bathroom. 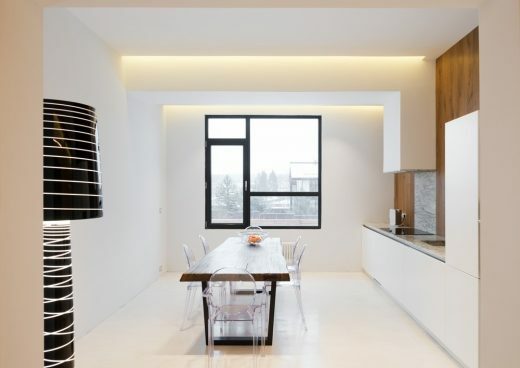 The house’s exterior and interior both embody functional minimalism. 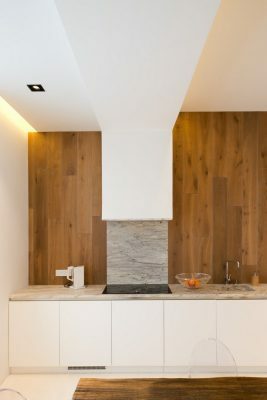 The façade and interior finishes are made of wood and natural stone, and there are several different types of white surfaces inside. The interior is inspired by the work of the great 1950s architect Alvar Aalto. 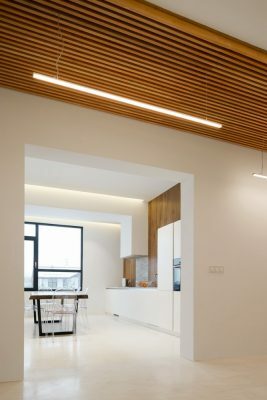 The key idea behind the interior design is to highlight connections between the three functional blocks by using textured wood alongside minimalist white geometry. 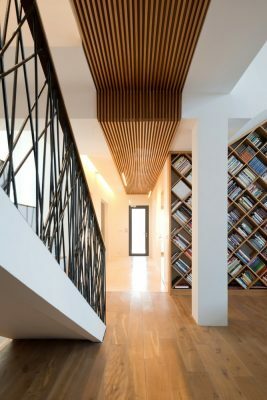 The textured wood ceiling plays a navigational role, guiding guests from the porch to the living room; then, in the heart of the house, it changes orientation from the horizontal to the vertical. 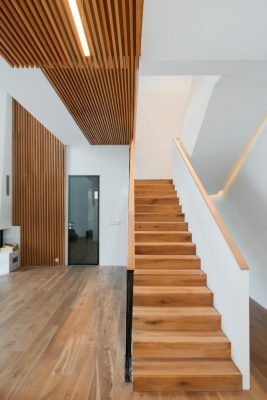 Wood is used in different ways in almost every part of the house and for every interior element: for the living room floor, then continuing fluidly with the stair components. 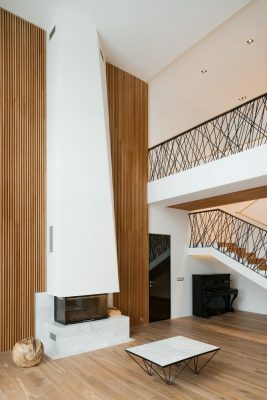 Wood planks are used throughout the house, starting with the entrance, and are also integrated into the exterior. 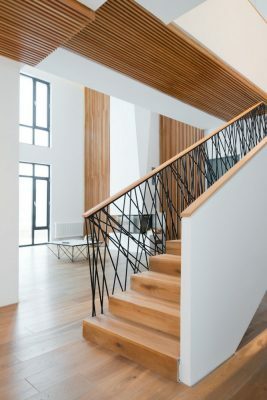 Another novel interior element is the custom bannisters. 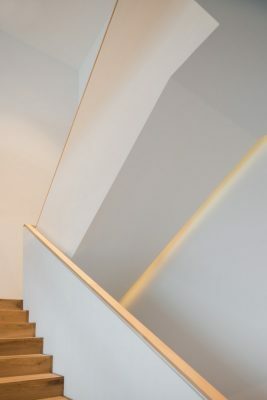 The idea was to design a light, self-supporting structure in harmony with the overall atmosphere of the house. 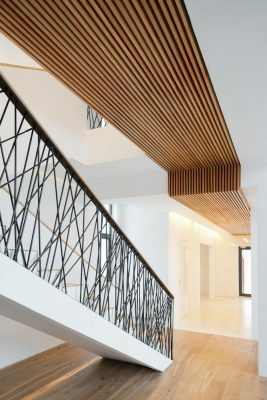 These railings use a system of crossed metal bars that provide not only aesthetic appeal, but give structural support to the bannisters, bracing them with an innovative steel frame. 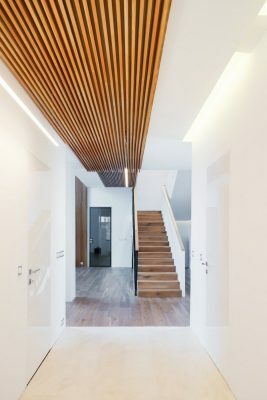 Thanks to these design solutions, the architect succeeded in creating a modern country house with a fully realized architectural concept.